Upgrades to the 2017 Honda Accord Announced! For 40 years, the Honda Accord has not only been an impressive member of the Honda vehicle lineup, but an impressive addition to the automotive world in general. To celebrate the Accord’s success, Honda is making several additions of its own to its signature sedan. By equipping the 2017 Honda Accord with the latest vehicle features and technologies, Honda has assured that the Accord will continue to be the best sedan in the industry. 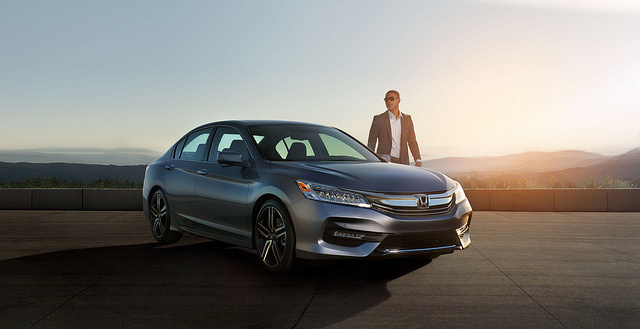 As far as specific upgrades to the 2017 Honda Accord, the exterior of the signature sedan has been designed to not only match the style of the Honda lineup, but also to look stunning while doing so. However, if you think that the 2017 Honda Accord looks lovely on the outside, wait until you get a peek at what’s inside! 10-way adjustable seats featured inside the 2017 Accord guarantee drivers the ultimate level of comfort. Things get even more comfortable with the available leather trim for the Accord. Finally, the Honda Accord has been outfitted with the latest in vehicle technology, including a Multi-Angle Rearview Camera and the Honda LaneWatch technology. Celebrate one of the longest-lasting and most reliable vehicles in the automotive world by purchasing a 2017 Honda Accord of your very own, here at Avery Greene Honda!